Numerous experimental data show that the brain is able to extract information from complex, uncertain, and often ambiguous experiences. Furthermore, it can use such learnt information for decision making through probabilistic inference. Several models have been proposed that aim at explaining how probabilistic inference could be performed by networks of neurons in the brain. We propose here a model that can also explain how such neural network could acquire the necessary information for that from examples. We show that spike-timing-dependent plasticity in combination with intrinsic plasticity generates in ensembles of pyramidal cells with lateral inhibition a fundamental building block for that: probabilistic associations between neurons that represent through their firing current values of random variables. Furthermore, by combining such adaptive network motifs in a recursive manner the resulting network is enabled to extract statistical information from complex input streams, and to build an internal model for the distribution p* that generates the examples it receives. This holds even if p* contains higher-order moments. The analysis of this learning process is supported by a rigorous theoretical foundation. Furthermore, we show that the network can use the learnt internal model immediately for prediction, decision making, and other types of probabilistic inference. Most memory models focus on pattern completion as computational operation for memory recall. However, obviously our brains can also answer questions that involve diverse experiences in unexpected ways. Consider for example the question whether we went with Mr. X more often to lunch than to dinner, or whether Mr. X would probably like the new restaurant Z. These queries could not be anticipated during the formation of memory traces. Still we can answer such queries (which are special cases of probabilistic inference: estimation of a posterior marginal) without any effort. We propose a model based on experimentally observed rules for synaptic plasticity (STDP), which explains how a network of spiking neurons can acquire this capability. A large number of experimental data from neuroscience and cognitive science suggest that the brain performs probabilistic inference for a large number of probability distributions p* that describe different aspects of the environment of the organism and its interaction with the environment (Griffiths and Tenenbaum, 2006; Bonawitz et al., 2014). In models for probabilistic inference in networks of neurons one has so far (with the exception of Siegelmann and Holzman, 2010; see Discussion) programmed the underlying distribution p* into the architecture and parameters of the network model. However brains have to learn internal models p of salient distributions p* in their environment from examples that are generated by p*. We present in this article the first model that explains how networks of spiking neurons could learn such internal models p through experimentally supported local plasticity rules. Furthermore, we show how a network of spiking neurons can store the learnt information in a way that makes it readily accessible for probabilistic inference. Two different approaches how networks of neurons in the brain could execute probabilistic inference have been proposed. One approach emulates an arithmetical (deterministic) algorithmic method for performing probabilistic inference through a suitable distributed organization of sums and products of probabilities (referred to as belief propagation or message passing; Steimer et al., 2009). The other approach for emulating probabilistic inference in networks of spiking neurons is based on the assumption that a network of neurons can “embody” a distribution p in such a way that it can generate samples from p. Probabilistic inference for p can then be performed through simple operations on these samples, for example the computation of a posterior marginal just requires to look at the distribution of the random variable of interest in these samples. This approach is known in computer science as Markov chain Monte Carlo (MCMC) sampling, and is widely used to perform probabilistic inference also for complex distributions p for which belief propagation approaches have no guarantee to provide correct answers. Whereas the previous approach prefers a deterministic network, where every stochasticity is detrimental for the performance, this second approach requires an inherently stochastic network of spiking neurons (Buesing et al., 2011). It has been argued that the dynamics of networks of neurons in the brain is in fact highly stochastic, both on the basis of inherently stochastic features of its components (such as stochastic synaptic release), and on the basis of trial-to-trial variability in neural recordings and observed variability in behavioral outputs. The learning model that is presented in this article ties in to this second approach, and shows that stochastic networks of neurons are able to automatically absorb the relevant statistical information from examples that they receive. As a result, we have now one first complete theory for the emergence of probabilistic inference in networks of spiking neurons through learning. We focus in this article on somewhat idealized models for spiking neurons and plasticity rules, which allow us to give rigorous proofs for the convergence of learning. We first show how an extension of an ubiquitous network motif of cortical microcircuits, interconnected populations of pyramidal cells with lateral inhibition (Winner-Take-All (WTA) circuits; Douglas and Martin, 2004; Nessler et al., 2013), gives rise to the basic building block for absorbing probabilistic information from examples. The output neurons of an array of WTA-circuits form the hidden layer of a three-layer feedforward learning module, to which we refer as a “stochastic association module.” We show that such a module can learn through spike-timing-dependent plasticity (STDP) and plasticity of the excitability of neurons (intrinsic plasticity) stochastic associations between the random variables that are encoded by the firing of neurons on its first and third layers. The module can learn this probabilistic information from the statistics of activation and coactivation of these neurons when the network processes examples that are provided by its environment. An important second finding is that recursive combinations of this network module can learn even complex probabilistic relationships between large numbers of random variables. This network learning capability is in fact universal in the sense that the underlying theory implies a proof of principle that an approximation to any distribution p* over discrete random variables can be learnt by exposing the network to examples drawn from p*. In fact, one can show that if the network is too small or has too few connections for learning a close approximation of p*, it will still strive toward approximating p* as well as it can, given its limited resources. The understanding of this learning process is supported by the theory of Expectation Maximization (EM). that are generated by p*. This does not hold for every neural network N , but like in any existing model for probabilistic inference in neural networks, only under suitable assumptions about the architecture of N . This result provides a proof of principle that networks of neurons in the brain can not only perform probabilistic inference for distributions p* whose parameters are specified in the genetic code, but also for distributions p* that an organism encounters in its environment. The underlying theory of EM does not guarantee that p* can be learnt perfectly. However it implies that a network N with a suitable architecture is expected to make progress in creating an increasingly more accurate internal model p for p* when it receives more and more examples that are generated by p*. EM does not guarantee that the internal model p converges to p*, but it implies that the network learning process cannot “run around in circles” where p moves forth and back between better and worse approximations of p*. This learning result is general insofar as it shows that internal models p can be learnt by a network N with a suitable architecture for external distributions p* over any number of discrete random variables, with arbitrary, also higher-order, dependencies among these random variables. However, although the architecture of N will obviously have to depend on the number of random variables of p*, we show that it suffices to assume that it consists of recursive interconnections of different copies of a simple generic network motif, to which we refer as a stochastic association module. This network motif is a three-layer feedforward network of excitatory spiking neurons with lateral inhibition on the hidden layer (see Fig. 2). We show that this simple microcircuit motif can be viewed as an atomic learning module, that extracts via STDP and intrinsic plasticity from examples probabilistic associations between input variables x and output variable z that are encoded through population coding on its input and output layer. An example is presented in Figure 3. We will then show in the following subsection that this atomic learning module can be recursively combined to form a network that automatically approximates through STDP and intrinsic plasticity arbitrarily complex distributions p* over many discrete random variables from examples generated by p*. In other words, this network learns an internal probabilistic model p for its stochastic environment p*. Furthermore, this network has the property that it can readily apply this internal model by carrying out probabilistic inference for p through its inherent stochastic dynamics. Examples are presented in Figures 6–9. would be a step function of length τ. However, we show in Examples 1 and 2 that the relevant learning properties also hold for α-shaped EPSPs that are commonly considered in theoretical neuroscience. On the side, we would like to point out that for biological neurons the EPSPs vary from shapes with a pronounced initial peak to shapes with smooth hills in dependence of the distance of the synapse to the soma (Williams and Stuart, 2002), and obtain yet other shapes if amplified through NMDA or Ca spikes (Larkum et al., 2009). The parameter w– is a baseline parameter in the learning rule, and τ is a parameter that corresponds to the duration of postsynaptic potentials (PSPs). Figure 1A shows the resulting STDP curve. The rule exhibits LTP only for pre-before-post spiking within a time window of duration τ, otherwise it exhibits LTD. The causal part of the STDP window curve has the same shape as the PSP kernel, which is similar to other theoretically derived plasticity rules (Toyoizumi et al., 2005; Pfister et al., 2006). The properties of this plasticity rule were studied by Nessler et al. (2013). It was shown there that it supports learning of an internal probabilistic model of the inputs in a WTA network. It was also shown there that the weight dependence of Δw in Equation 1 fits quite well to experimental data. Figure 1B shows that the shape of the STDP curve according to Equation 1 looks like the commonly considered one when applying an intermediate pairing frequency of 20 Hz (Sjöström et al., 2001 shows experimental data on the dependence of the shape of the STDP curve on the pairing frequency). STDP curves of the synaptic plasticity rule. A, The STDP curves show the weight change for a presynaptic spike at time tpre and a postsynaptic spike at time tpost , for different time differences tpost – tpre . The red curve represents STDP for the simple rule that is used in the theoretical derivations. In computer simulations, we used also an STDP rule shown with the blue curve, that has a smoother, more biologically realistic shape. B, The change of the synaptic efficacy after a stimulation protocol where both the presynaptic and postsynaptic neuron fire at a frequency of 20 Hz, for different time differences Δt between a postsynaptic and presynaptic spike. The STDP curve shifts more toward LTP, and depression is no longer time independent due to overlapping PSPs (Nessler et al., 2013, their Fig. 4). This STDP curve is quite similar to experimental data (Sjöström et al., 2001). consisting of concrete assignments of discrete values to the variables x and z, that are drawn from some unknown distribution p*(x, z). We want to determine under what conditions a network module is able to create autonomously from exposure to these examples an internal model p(x, z) for p*(x, z), that approximates p* when the number of examples grows. Note that in general the same input x will occur in combination with different values z(1), z(2), . . . of z in the training examples, and the goal of learning is to learn for each value z(i) the probability that it occurs for input x. Hence, the learning performance will not be evaluated by counting errors, ie, deviations from a target output value. Rather, it will be evaluated by how well the network reproduces for any input value x the distribution of output values z. We show that a three-layer network of spiking neurons with the architecture shown in Figure 2 can accomplish this learning task through STDP on synaptic connections from the first to the second layer and intrinsic plasticity of excitatory “hidden” neurons α on the second layer. The weights of synaptic connections between the second and third layers are assumed to be fixed. These weights are assumed to have a large value, so that the firing of a neuron α on the second layer causes with very high probability the firing of the neuron on layer 3 to which it is connected. are inhibited, so that they cannot fire (actually, it would suffice to block STDP for these neurons). An alternative view is that only a selected subset of neurons is disinhibited. New experimental data (for review, see Caroni, 2015) suggest that in fact inhibition of synaptic plasticity (especially via Somatostatin-positive neurons) and disinhibition via VIP interneurons (Letzkus et al., 2015) play an important role in the control of plasticity in cortical microcircuits. (see Materials and Methods, Theorem 1 and Theorem 1*). The implicit generative model of the module is encoded in the synaptic weights and biases of the α neurons. One may wonder why a two-layer network would not suffice for learning such stochastic associations between random variables x and z. The simplest approach would be a model without hidden neurons, where the strengths of the synaptic connections between the neurons in the population codes for x and z encode the probability that a vector x is encountered in conjunction with a particular value of z. But this approach would restrict very much the types of internal models p(x, z) that the network could learn. In particular, it could not handle a situation where the distribution p *(x, z = l) is multimodal, ie, when there are multiple modes in the distribution of x that are likely to occur in conjunction with a specific value l of z. For example in Figure 3B for z = 2, the distribution p *(x, z = 2) has two modes, ie, x 1 = 1 can occur in combination with x 2 = 2, and x 1 = 2 in combination with x 2 = 1 (whereas the assignments where x 1 = x 2 do not occur). The reason for this restriction to unimodal distributions is that the neuron ζl that represents z = l in the population code for z would have to represent through the implicit generative model that is defined by the weights of afferent synapses and its excitability the marginal distribution p *(x, z = l). However, a single linear neuron can only represent one mode of a probability distribution of x. However if one considers more complex neuron models with nonlinear dendritic processing, they can in principle also represent multimodal distributions (Pecevski et al., 2011, their Figs. 4 and 5; Legenstein and Maass, 2011). Hence, with such more complex neuron models a more shallow learning network could potentially be used as a learning module in our architecture. correspond to their probabilities of firing shown in D.
that encode the variables x. This mixed coding is reminiscent of experimental data on neurons in the cortex (Rigotti et al., 2013; Mante et al., 2013). We exploit here a generic property of STDP in WTA circuits, that was made explicit by Nessler et al. (2013) and Habenschuss et al. (2013b): if the neurons in the populations for the variables xi are synaptically connected to a set of neurons α in a WTA circuit, and these synaptic connections are subject to STDP, then the neurons α learn automatically a multimodal internal model for the distribution of the variables x. The learned probabilistic model is a mixture of multinomials. More precisely, each WTA neuron α specializes to fire in response to input patterns from one mode of p*(x). This specialization is produced by the plasticity rules (Eqs. 1, 2), which, when a neuron fires in response to some input pattern, adapt the weights and biases of the neuron so that in the future it fires with higher probability in response to the same pattern. At the same time, the competition enforced by the lateral inhibition between the α neurons tends to prevent that multiple WTA neurons specialize on the same mode of p*(x). = l) it learns to approximate this distribution. by the firing probabilities of the output neurons (Fig. 3D). A typical resulting firing pattern is shown in Figure 3F. The stochastic association module shown in Figures 2 and 3 is self-consistent in the sense that the input variables xi are encoded through population coding in the same way as the output variable z. Hence, one can recursively combine these modules so that the output population of one module becomes part of the input population of another module (Fig. 4). The resulting more complex network is then not only able to learn a single probabilistic association between RVs, but many such associations simultaneously. The basic learning modules form here not only chain connections, but typically also cycles, where the RV that is the output of the second module is simultaneously an input to the first module in the chain (like the variable yk in Fig. 4). form a Markov blanket of yk . Each variable xi is encoded by the same population coding as the output variables of learning modules, and can therefore be produced by the output of another learning module (as shown for the RV xl ). As here yk is in the Markov blanket of xl , yk appears among the input variables of the upper module, and its corresponding input neurons are the same as the output neurons of the lower module. Elementary results from probability theory imply that such recursive combinations of probabilistic associations between RVs have a very powerful, in fact universal, representation capability: the dependency structure of every probability distribution p* over discrete RVs can be represented as a network of probabilistic associations between each of the RVs yk and a subset of the other RVs (Bishop, 2006). More precisely, in the representation of an arbitrary distribution p* one has a subnetwork (module) for each RV yk of p* that has yk as output variable and the random variables in the Markov blanket y B ( k ) of yk as input variables. The Markov blanket defines a set of random variables so that conditioned on their values, yk becomes independent from all remaining variables. For example, if p* can be represented by a Bayesian network, it suffices to include in y B ( k ) the parents of yk together with the children of yk , and their coparents. as described above). If one decodes the current firing activity in the network N at any time t by setting each RV yk to that value that is indicated by the most recent firing of a neuron in the population code for yk , the resulting distribution of value assignments to the RVs y 1, . . . , yK of p* over time is exactly the one given by p*. In other words, p* is the stationary distribution of the Markov chain that is defined by this network N of stochastically firing neurons. On the side, we would like to point out that this holds only after some initial “burn-in” phase, during which the distribution of network states becomes independent of the initial network state (Habenschuss et al., 2013a). , as described in the preceding section. , one for each RV yk . from which the examples are generated. One also refers to this type of learning as density estimation. Like other generative models for unsupervised learning, our model also aims at extracting underlying structure in the training examples (Hinton et al., 1995), so that it can even generate fake examples that share the discovered underlying structure (Fig. 7). On the level of higher cortical areas such unsupervised learning could detect relationships between different types of features (Figs. 6–9), between object representations in different sensory modalities, or how an action modifies the environment. for the RV y 1 in the neural network in C.
are in general presented to the network without any supervision, ie, without any associated target output. This feature of the learning process is shared with parameter learning in Bayesian networks, where the learning of a conditional probability table for a RV y may look locally like supervised learning, because both the values of its parent nodes and the value of y are extracted from each training example. given a particular input yI . However, note that, as it learns the joint distribution, the network can additionally also answer any other probabilistic inference queries based on the probability distribution p* of the examples (see section “Flexible retrieval of learnt statistical information through probabilistic inference”).
. Rather, as in all known cases of nontrivial unsupervised learning and self-organization it can only guarantee that a local optimum is achieved (which cannot get worse if learning continues). However, even this weak form of a theoretical guarantee is actually quite rare in the literature on neural network learning via STDP. Most known successful methods for unsupervised learning or self-organization in machine learning are supported theoretically in the same weak manner via Expectation Maximization. However many of these methods work very well in practice. The learning speed and quality depend for the learning framework that we have introduced on the nature of the target distribution p*. We are demonstrating in Example 2 that this learning scheme works well for an example of p* where it is well known that humans are able to learn a good approximation of probabilistic inference for p*. to p*. Hence, if these modes represent individual memory items of a memory model, the network N can combine information from many different memory items (episodes), also in ways that could not be anticipated during learning.
. For example, in Example 1 we had chosen just two hidden neurons in α for each of the two possible values of z, instead of two times four that were used in the construction of Pecevski et al. (2011) for representing all four possible assignments of values to the inputs x of a module. But as the comparison of Figure 3, B and C (and of D and E) shows, the network with the smaller number of hidden neurons α works in this case about as well as the larger network. This effect is predicted from general results in learning theory: a learning network with fewer parameters sacrifices representation power, but gains generalization capability. Furthermore, naturally occurring distributions can often be approximated quite well by mixture distributions with a relatively small number of components (modes). This suggests that real world distributions p* of examples can often be learnt by relatively small networks N . An ideal scenario from a biological perspective would be one where a population of hidden neurons in N can become larger if the size provides insufficient resolution or prediction capability for the examples that it receives. for different values l (Fig. 3 provides an illustration). In the experiment of Knill and Kersten (1991), the demonstrated different perception of the shading in the two surfaces in Figure 6A (see legend for more details) can be explained by two different competing causes, either by different relative reflectance of the two abutting surfaces (y 1), or by their cylindrical 3D shape (y 2). An observed curved contour of the surfaces is a cue that increases the probability of a cylindrical 3D shape. Because a cylindrical 3D shape alone is enough to explain the shading, it reduces the probability that the relative reflectance is different. Hence, one of the competing causes, the cylindrical 3D shape, “explains away” the other possible cause, the different reflectance of the surfaces. In the other case, when a flat contour is observed as an additional cue, this increases the probability of a rectangular 3D shape. As a rectangular 3D shape cannot explain the observed shading, the probability of the second possible cause for the shading, the different reflectance is increased. This type of explaining away in probabilistic inference can only occur for distributions p* that have higher-order interactions between three or more RVs, like between the two competing causes and the observed shading in this example. We show that the underlying distribution p* can be learnt (approximately) from examples for this visual perception task, and that the network N which learns this approximation learns simultaneously to deal with the explaining away effect as an emergent phenomenon. We performed computer simulations of learning with this network, where examples drawn from the target probability distribution p* were presented to the network successively during learning. The distribution p* was defined according to Table 4 in Materials and Methods in order to capture the visual perception scenario of Figure 6 in a qualitative manner. The learning phase took 1200 s of simulated biological time, and each example was presented for a time period of 100 ms. The weights and biases of the neurons were randomly initialized before learning. obtained in this way from the spontaneous firing of the network N is shown in Figure 7B and compared with the target distribution p*. of the network are shown as green bars. The coloring of the network states labels is the same as for corresponding network states in A. Black bars indicate the probabilities of the same value assignments under the distribution p* that had produced the examples for learning. of p*, as shown in Figure 8D, which according to the theory leads to a good approximation of p* by the network. (green bars), for each problem variable yk . The bit string labels on the x-axis denote the assignment of values to the problem variables on which each distribution is conditioned. The PSPs and STDP curves in the simulated network have a more biological smoother alpha shape, which differs from the rectangular shape used in the theory. This can introduce minor deviations of the learning convergence from the theoretically optimal one, as for example the slight increase of the KL divergence in Figure 8C in the second half of the learning process. (by inducing corresponding neurons in their population codes to fire at high rates) the conditional marginal probabilities of other variables yi can be read off from the firing rates of neurons that represent yi through population coding. In particular, we demonstrate in Figure 9 that the network N has acquired autonomously from examples the capability to carry out nontrivial probabilistic inference that involves explaining away (ie, higher order dependencies among random variables). Finally, we would like to point out that our approach is not restricted to Bayesian networks; it can be applied to any type of graphical models, eg, also to Markov random fields and factor graphs. The network connectivity is determined by the Markov blankets of the random variables, which can easily be read out from the graph structure of any graphical model. We first present a rigorous learning theory that supports the learning results that are presented. After that, we provide details to the computer simulations. represented in the module. After that, in the two subsections “Firing probability of the output neurons resulting from the internal generative model” and “Deriving the probability distribution of the firing of the neurons α ” the firing of the output and the alpha neurons in the module is expressed through the represented probabilistic model. The last subsection “The plasticity rules minimize the KL divergence through Expectation Maximization” continues with the explanation how the plasticity rules implement learning of the stochastic associations between the variables x and z through EM. is such that no two neurons fire in the time interval (t – τ, t], ie, after a spike there is no spiking period of duration τ. If there is no spike in the interval (t – τ, t], then the value of xi is 0.
, which follows from the specific connectivity structure in the learning module. The sums with the indices i and m iterate over all input neurons χim . , respectively. These values could represent states of the external environment, internal beliefs or any other behavior related variable value. However, in the population coding of values of the variables z and xi (i = 1, . . . , I) by their corresponding neuron populations in the learning module, the variables can have an additional value of zero. A neuron population that encodes a variable through population coding assigns value zero to this variable if none of the neurons fires for a period longer than τ. There is not a dedicated neuron whose firing signals a zero value, as is the case for the rest of the non-zero values of the variable. The assumed spike based encoding with a zero value is the same as in the neural sampling theory (Buesing et al., 2011; Pecevski et al., 2011). It defines a value for the variable at each moment in the continuous time dynamics of the neural network model. in its internal model where some of the variables z and xi (i = 1, . . . , I) have zero value. These probabilities have very fixed small (close to zero) values (see section “Firing probability of the output neurons resulting from the internal generative model”). Therefore, it is assumed that the examples contain only the encoded variable values whose stochastic relations can be learnt by the learning module. fires and sets the value of a to be (l, j), then this also uniquely determines z, ie, sets the value of z to z = l.
For convenience, Table 1 lists the mathematical notation that is used in the definition of the learning module. where at least one of the variables z and xi (for i = 1, . . . , I) has zero value are much smaller than the probabilities of value assignments where all variables have non-zero values (Eq. 5). through Expectation Maximization” in that the proof is based on analyzing mean weight updates of the plasticity rules over the complete data distribution.
. As we pointed out at the beginning, this derivation is an important step in the proof that the plasticity rules implement the Expectation Maximization algorithm (see next subsection). subject to the normalization constraints (Eq. 6). through Expectation Maximization”). In view of this established link between the offline mean update of the weights and the EM algorithm, we see that the online plasticity rules in the neural network implement an online stochastic approximation of the EM algorithm in the spirit of Monte Carlo EM (Wei and Tanner, 1990; Jank, 2006). is then retrieved as a sum of the unimodal distributions. The unimodal mixture component is implicitly represented in the weights and the bias of the corresponding neuron, where the vector of synaptic weights of the neuron actually represents the center of the mixture component, ie, the location in the input pattern space where its mode peaks with maximum probability. We will give in this subsection a proof of Theorem 1 from the previous subsection “The plasticity rules minimize the KL divergence through Expectation Maximization.” The theorem captures the main property of the learning module discussed in Results, section “A network module for learning stochastic associations,” ie, that the plasticity rules install in the module an internal representation of the stochastic associations between the variables x and z in the presented examples. Before we present the main part of the proof, we first introduce some needed definitions and derivations.
. Therefore, for a time period of duration of one EPSP τ at the beginning of the presentation of a new example, the update of the synaptic weights and biases might be incorrect. Nevertheless, if τ is several times smaller than ΔtE , this incorrect contribution to the learned weight (or bias) update should be insignificant. (34) in order to match the values p*(xi = 0) = 0 and p*(z = 0) = 0. In simulations, the probabilities over zero values represent a very small, insignificant portion of the mass of the learned generative model. This is also true when learning with a network of interconnected learning modules (see section “Theoretical properties of networks of recursively interconnected basic learning modules”). , which is consistent with Equation 34.
, we return to the question what mechanisms in the dynamics of the learning module implement different steps of the EM algorithm. as the expectation in Equation 39. We will refer to this equation when we show that the learning module implements an online stochastic approximation of the generalized EM algorithm outlined here (see text after the convergence proof). during learning converges exactly to these local maxima. are also its unconstrained local maxima. in Equation 26under the normalization constraints in Equation 6. After introducing the necessary definitions and notations in the previous subsections, we use them here to restate the Theorem 1 from the subsection “The plasticity rules minimize the KL divergence through Expectation Maximization” in more technical terms. in Equation 26 subject to the normalization constraints (Eq. 6). , subject to the normalization constraints, which concludes the proof. by calculating an expectation over the complete data samples from the distribution (Eq. 29) which represents the expectation step of the EM algorithm. In the subsection “The plasticity rules minimize the KL divergence through Expectation Maximization,” we already showed that the spikes of the neurons α together with the presented examples represent the complete data samples drawn from Equation 29. This clarifies that the offline mean update of the plasticity rules indeed implements the maximization step of the generalized EM algorithm as defined in Equations 42 and 40. From this, it follows that the online plasticity rules implement an online stochastic approximation version of the maximization step of EM. The proof of Theorem 1 (reformulated in Theorem 1* in this subsection) completes the theory behind the learning mechanisms and learning capabilities of the learning module described in Results, section “A network module for learning stochastic associations.” In particular, it rigorously shows that the learning module learns, via the EM algorithm, an internal model of the probabilistic relations between a set of variables x and another variable z in the presented examples. This section contains additional details on the learning approach with networks of recursively connected learning modules, that we described in Results, section “Recursive combinations of the basic learning module enable efficient learning of complex distributions from examples.” After presenting the learning procedure for such networks, we will formulate in this section Theorem 2 which contains the theoretical basis of learning with networks of learning modules. Theorem 2 is derived from Theorem 1 (see section “The plasticity rules minimize the KL divergence through Expectation Maximization”), and shows that the plasticity mechanisms in a network of modules minimize another objective function that pertains to the represented probabilistic model in the whole network. This minimization then leads to learning an internal model of the stochastic associations between all variables yk of the presented examples. The mathematical symbols that are used in the definition of the neural network are listed in Table 3.
. Note that in the examples drawn from the target probability distribution p* such states are not present as the RVs yk in the examples have values from 1 to M(yk ). The zero values occur only in the neural network dynamics and they do not refer to meaningful values of variables in the external environment. should be large enough so that if the spike of the last neuron was at time t, a new neuron fires almost immediately after t + τ, ie, the in-between time period where yk (t) = 0 should be very short (ideally its duration should be equal to 0). from Equation 79 closer to the desired firing probability in the NCC (Eq. 78). , as we show in our computer simulations.
. The posterior probabilities can then be estimated simply by counting the generated samples.
. Synaptic weight changes induced by the plasticity rule that would go below wmin , or above wmax , were clipped to wmin , or wmax , respectively. neurons of the known RVs. The currents were injected in exactly the same way and with exactly the same amplitudes as during the presentation of the examples in the learning process (see below). were both equal to 0.5.
did not receive any external current.
. The PSPs at the synapses connecting from, and to, the inhibitory neurons of the lateral inhibition had a rectangular shape with duration of τ = 15 ms. 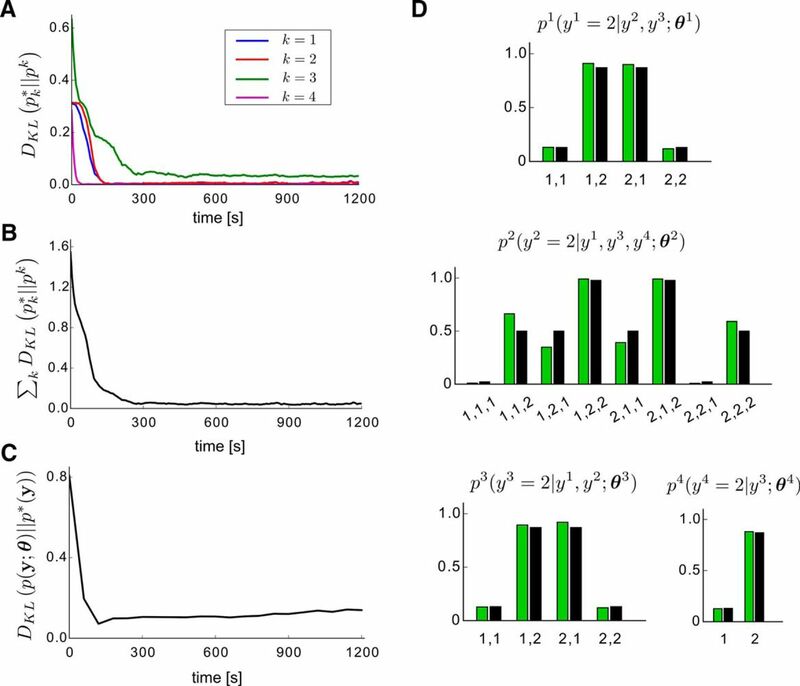 The rectangular IPSPs of the inhibitory neurons approximate the effect that fast-spiking bursting inhibitory neurons with short duration IPSPs would have on the membrane potential of the neurons α . The synaptic weights of the connections from the inhibitory neurons in the lateral inhibition to the neurons α were all equal to wi 2e = −7. in different learning modules have different number of input synapses, the bias offset parameter was set for each neuron to counter-balance appropriately the average total input it receives from the input synapses. of the learning modules were calculated analytically by using Equation 5, and then marginalizing α .
. All other parameters in this example that define the learning module, as well as the learning process, were the same as the parameters of the learning modules in the computer simulation in Example 2 (see section “Details to the computer simulation in Example 2”). Numerous models for probabilistic inference in networks of neurons have been proposed, and many models for the impact of learning on network computations have been proposed. However, surprisingly, these two lines of research have so far (with a few exceptions that are discussed below) not been brought together. We propose in this article a new model for learning and memory organization in recurrent networks of spiking neurons that makes the information that is gathered from numerous experiences immediately available for complex and unforeseen memory retrievals in the form of probabilistic inference. The network is able to perform such probabilistic inference just through its inherent stochastic dynamics. More precisely, we assume that the network receives samples (=examples) from some unknown multivariate distribution p*, and show that a suitably structured recurrent network of spiking neurons is able to build through STDP and intrinsic plasticity of the excitability of neurons an internal model for p* in such a way, that it can answer a diverse repertoire of probabilistic inference queries about the stored knowledge through sampling. Early models for memory storage and retrieval in recurrent networks of artificial neurons (Steinbuch, 1961; Hopfield, 1982, 1984) had focused on the storage of isolated memory items in attractors of a deterministic network dynamics. The only memory queries that are considered in these models are input completion tasks, or finding the most similar memory item to the input pattern. Answering queries that require the combination of several stored memory items is virtually impossible in such model, especially because the stored memory items were required to be scrambled (orthogonalized) before they were committed to the network. This is inconsistent with experimental data on human memory, which require a substantially more structured memory organization (Stickgold and Walker, 2013). We have shown in this article, that very simple network motifs (Fig. 2) provide learning modules, which can extract probabilistic relationships between random variables from examples, simply by applying STDP and intrinsic plasticity. One feature of these network motifs is that different groups of neurons on layer 2 project to different neurons on layer 3. Such nonconvergent synaptic connections are difficult to identify with current experimental methods, but have already been found in the mouse cortex (Chen et al., 2013), where largely nonoverlapping populations of pyramidal cells in layer 2/3 of area S1 project to areas S2 and M1. Somewhat similar fine-scale connectivity patterns had previously been found within a cortical column of rat visual cortex (Yoshimura et al., 2005; Kampa et al., 2006). It remains to be tested whether these fine-scale network structures in the brain support the learning of stochastic associations as predicted by our model. These simple stochastic association modules can be recursively combined (Figs. 4, 5), and are then able to learn also complex stochastic relationships, including higher order moments (eg, explaining away), from examples. We have demonstrated this for a well-known visual inference task from Knill and Kersten (1991), which is known to require explaining away (Figs. 6–9), but where it has been an open question whether brains could in principle acquire this capability through learning. Furthermore, we have shown that this impressive learning capability of recurrent networks of spiking neurons can be understood for simple rules for STDP and intrinsic plasticity of neurons on the basis of a rigorous mathematical theory (Expectation Maximization). The representations of statistical knowledge in networks of spiking neurons that are shown here to result from learning are structurally very similar to previously proposed ones by Pecevski et al. (2011) that were based on construction instead of learning, with one important difference: whereas the constructed networks required very large numbers of auxiliary neurons for representing random variables with larger Markov blankets, we show here that similar networks but with realistic numbers of hidden (auxiliary) neurons can still provide good approximations. These smaller modules automatically learn to make optimal use of the number of auxiliary neurons that are available to them. They learn automatically to approximate complex stochastic associations between random variables that emerge from examples, with a mixture distribution whose maximal number of components (modes) fits to the available number of auxiliary neurons. We have demonstrated this important feature of our learning approach in Figure 3 (compare panels B,D and C,E) and in our model for explaining away in Figure 6 (where the number of auxiliary neurons in the learning modules (Fig. 6D) is smaller than the number required by the construction of Pecevski et al.(2011)). One other interesting general feature of our model is that it shows how noise in networks of neurons can be beneficial. In fact, noise provides here a necessary ingredient both for the self-organization of the network through STDP, and for the use of learnt probabilistic relationships for probabilistic inference via MCMC sampling (Habenschuss et al., 2013a). The necessary stochasticity in the neurons can come from different sources like for example the unreliable neurotransmitter release from the vesicles at the presynaptic site, or the stochastic closing and opening of membrane ion channels (Faisal et al., 2008). Finally, we would like to point out that our network model produces answers to probabilistic inference queries (Fig. 9) in the form of firing rates, which is obviously useful for communicating such answers to downstream networks. Internally however, the network works with a spike-based encoding of network states, where every spike has an impact on the network state (Fig. 7). Our model and theory has identified concrete plasticity mechanisms and network architectures that would enable networks of neurons in the brain to build probabilistic internal models for their stochastic environment. We have focused here on an idealized model in order to keep it theoretically tractable. Further work will have to explore to what extent similar learning phenomena arise in more complex neural network models that sacrifice theoretical tractability for additional biological details. There are several studies that propose neural implementations of probabilistic inference in general graphical models where, as in our approach, the present independencies of the distribution are directly exploited for reducing the complexity of the neural network structure. The majority of these base their implementations on the loopy belief propagation algorithm (Rao, 2006; Steimer et al., 2009; Siegelmann and Holzman, 2010; Litvak and Ullman, 2009). Except for Siegelmann and Holzman (2010), to the best of our knowledge, none of these studies proposes a way how these neural structures could emerge through learning from examples. The model of Siegelmann and Holzman (2010) is formulated on a more abstract level. It is based on the observation that belief propagation (message passing) requires only three arithmetical operations: summation, multiplication, and division (for normalization). Their network model is based on symbolic computational units (interpreted as multicompartment neurons) that carry out these arithmetical operations on real numbers. The resulting real numbers are interpreted as probabilities or messages that are sent to other units during belief propagation. Estimates of conditional probability tables are extracted from examples through online accumulators, assumed to be implemented as plasticity of the weight of a dendritic branch that represents a specific value assignment for a set of random variables (more precisely, for the Markov blanket of a random variable). Hence, this learning model is not based on synaptic plasticity, but rather on a plasticity mechanism that changes the weight of a whole dendritic branch. We are not aware of an attempt to implement this approach with spiking neurons, or with more local plasticity rules. 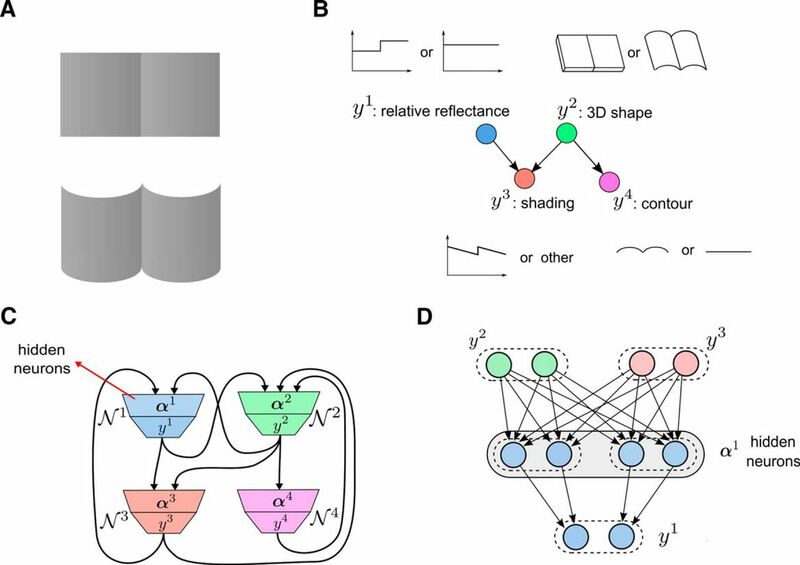 An alternative framework for probabilistic inference in neural circuits developed by Ma et al. (2006) and Beck et al. (2008, 2011, 2012) is based on representation of probability distributions in probabilistic population codes. To the best of our knowledge, the question of how the neural implementations in those studies can emerge through learning with local plasticity mechanisms has so far not been addressed. We have focused in this paper on the task of learning time-invariant distributions p* over static patterns. 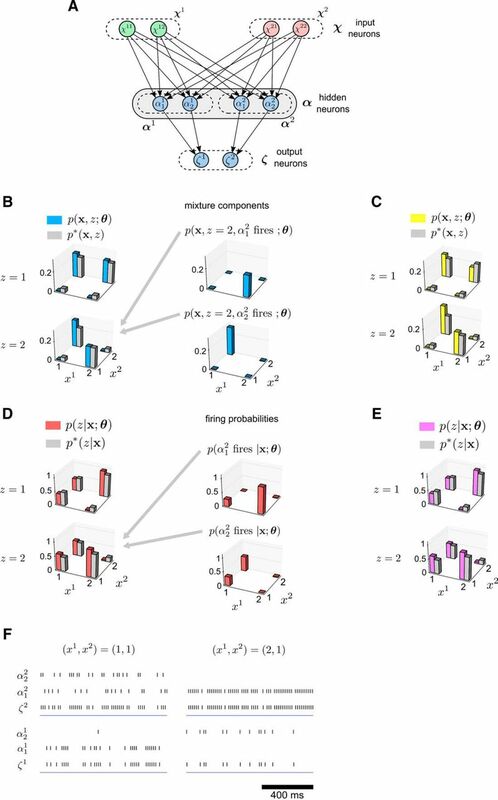 Complementary to this, in several studies (Deneve, 2008; Rezende et al., 2011; Brea et al., 2013; Kappel et al., 2014) the authors developed neural network models for learning time-varying distributions, restricted to dynamical Bayesian networks that do not have dependencies between the RVs in the same time step, which simplifies the learning. In these models, the network learns to reproduce sequences of patterns, by developing latent representations as a memory about the recent history of patterns, and learning the stochastic transitions between the patterns in the sequence. In contrast to this, the neural networks in our approach learn a probability distribution of static patterns as their stationary distribution, where the distribution can contain arbitrary dependencies between the random variables without any restrictions. The problem of learning a probability distribution from examples has been well studied in the artificial neural network community. 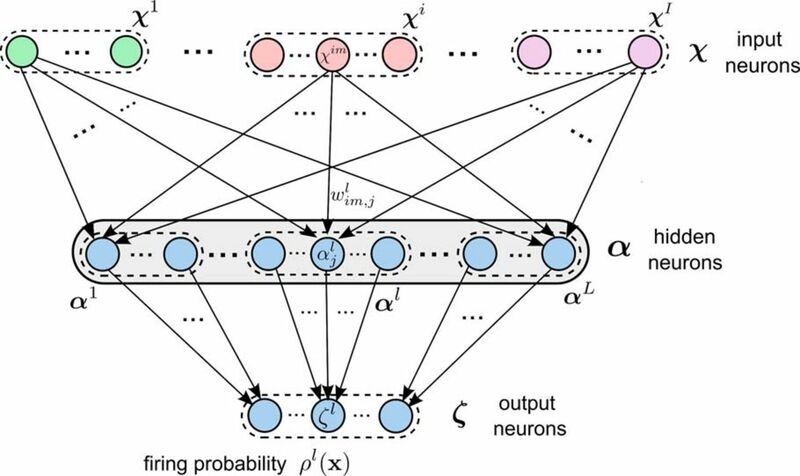 The Boltzmann machine is one of the earliest developed neural networks that can learn general probability distributions (Ackley et al., 1985). The learning in the Boltzmann machine is however difficult for learning higher-dimensional probability distributions with a larger number of RVs (Hinton, 2002; Carreira-Perpinan and Hinton, 2005). Building on the Boltzmann machine idea, more recently developed deep belief networks have considerably improved the efficiency and scalability of learning by using a Boltzmann machine with a two-layer bipartite graphical model structure, called restricted Boltzmann machine, which is easier to train than the general Boltzmann machine (Hinton et al., 2006). 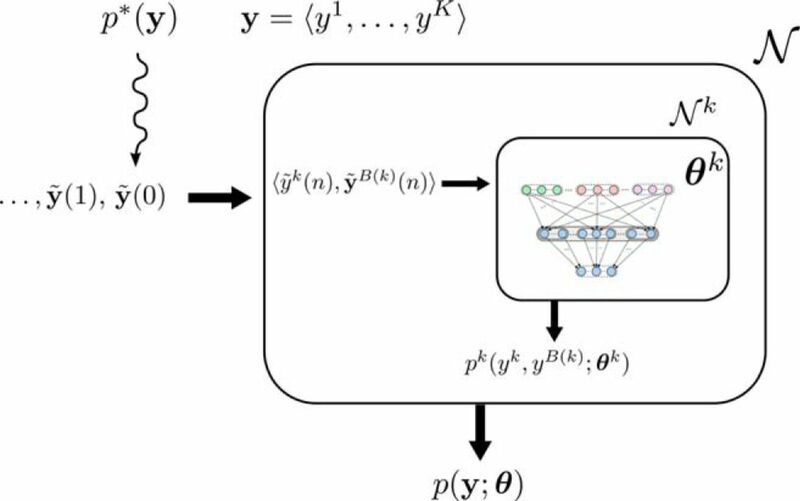 Deep belief networks learn multilayer latent representations of the input data in a generative model by training layer-by-layer restricted Boltzmann machines. As in our approach, the learned probability distribution is embodied as a stationary distribution of the network states. However, the structure of Boltzmann machines and deep belief networks exhibits symmetric weights between the neurons which are not found in biological networks of neurons, and also the biological plausibility of layerwise training and the learning rules in these networks is not clear. These approaches derive their learning rules from the maximum likelihood learning principle. Our learning approach for network of interconnected learning modules, on the other hand, is more reminiscent to maximizing the pseudo-likelihood (Besag, 1975), an alternative parameter estimation method in statistical learning, where the objective function can be formulated through the Kullback–Leibler divergences between the target and the model conditional distributions of one variable given the rest of the RVs. The difference is that in the pseudo-likelihood objective function the conditional distributions are all derived from a single probabilistic model, whereas in our approach each learning module learns a separate generative model of a marginal of the target probability distribution. with z ≠ l. This architecture provides concrete hypotheses for the analysis of data on the role of inhibitory neurons in the organization of plasticity (Caroni, 2015; Letzkus et al., 2015). Furthermore, our model for an atomic probabilistic learning module predicts that pyramidal cells within a network can represent probabilistic, rather than only deterministic relationships. This can in principle be tested experimentally by exciting (eg, through optogenetic methods) a subset A of these neurons, and observe the resulting firing probability of pyramidal cells B. Furthermore our model predicts that this firing probability of neurons in B can be changed upward through trials where both neurons in A and B are made to fire, and changed downward through trials where neurons in A are made to fire and neurons in B are inhibited. In contrast to preceding memory models, our model does not predict that synaptic connections between neurons are in general symmetric. This would actually be impossible for synaptic connections between excitatory and inhibitory neurons. But also for synaptic connections between pyramidal cells in the cortex a symmetry of synaptic weights between them is not really consistent with the currently available experimental data (Song et al., 2005; Haeusler et al., 2009, their Fig. 4). With regard to the plasticity mechanisms involved, our model points to an essential contribution of intrinsic plasticity of the excitability of pyramidal cells for memory formation (Mozzachiodi and Byrne, 2010). An interesting functional prediction of our model is that memory recall cannot only take the form of input completion (like in a Hopfield network), but can engage the full power of probabilistic inference. Furthermore, it proposes that this inference is implemented through the inherent stochastic dynamics of networks of neurons in the brain. Such implementation has previously already been proposed on the basis of data from cognitive science (Denison et al., 2013; Vul and Pashler, 2008). Furthermore our model predicts that memory recall and imagination of possible scenarios are closely related brain computations, that engage similar network mechanisms. This prediction appears to be consistent with recent experimental data, which suggest that memory recall and imagination/fabulation engage largely the same brain systems (Schacter, 2002). Finally, our model predicts that the development of suitable brain networks that store basic insights about typical causal roles and dependencies of the objects and phenomena we encounter is essential for learning. This prediction is in line with experimental results from cognitive science, which argue that such basic knowledge about dependencies in the real world is already known to 2-year-old children (Landau et al., 1988). Because our learning approach emphasizes the role of probabilistic inference, it also provides a theoretical framework for integrating innate or previously learnt knowledge in the form of priors. The learning paradigm that we have presented was designed to provide an alternative to other neural network models for higher-level memory. Such higher-level memory system in the brain receives high-dimensional inputs y from numerous brain areas, in particular also higher-level features that are extracted from sensory inputs by other learning systems. It is at this point an open question to what extent the proposed model for learning in networks of spiking neurons can also provide insight into the organization of lower level learning systems in the brain, for example in the visual system. The underlying mathematical approach is quite general, and guarantees convergence to an internal model for any external distribution p* over discrete RVs that generates the examples y that are presented to the network. How good this internal model will become is related to the question how well p* can be approximated by a Bayesian network with small degrees of nodes, or more generally, by a simplified distribution where all RVs have small Markov blankets. However, a precise answer to this question is even more difficult, because our model is in principle also able to approximate some distributions with large Markov blankets, see the remarks at the end of Results section “Small numbers of hidden neurons in the learning modules often suffice.” Numerical tests for a number of practically relevant distributions p* are likely to provide further insight into this question. In principle, it is also possible to boost the learning capability of our approach by stacking multiple copies of the learning network. 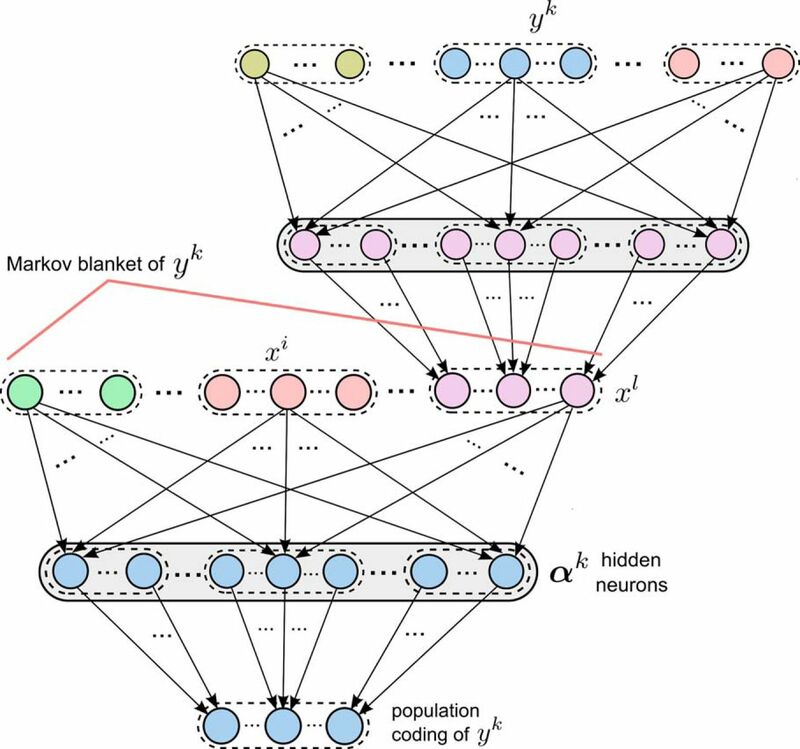 The α neurons in the network learn to encode salient combinations of values of different RVs, similarly as feature detectors on the first hidden layer of a deep learning network. Hence, it would make sense to send the output of these α neurons also as input to a version of the same type of learning network on a second level. One would then expect that the second level network learns in the same unsupervised manner to detect and represent salient combinations of values in these α neurons. The analysis of the performance of such a stacked learning architecture based on spiking neurons and STDP is a topic for future research. Altogether, we have shown that some forms of probabilistic inference can be learnt through STDP, even in cases where the nontrivial “explaining away” effect occurs (Figs. 6–9). We propose, that this new paradigm for network learning provides an alternative to previous models for associative learning that were based on learning categorical rather than probabilistic associations. In addition, in contrast to earlier memory models, this new model is compatible with basic properties of biological networks of neurons, such as spikes, trial-to-trial variability, stereotypical microcircuit motifs, and STDP. ↵2 D.P. and W.M. designed research; D.P. analyzed data; D.P. and W.M. performed research; D.P. and W.M. wrote the paper. ↵3 This work was partially supported by the European Union project FP7-604102 (Human Brain Project). We thank Stefan Habenschuss for helpful comments on an earlier version of the paper. Beck J, Heller K, Pouget A (2012) Complex inference in neural circuits with probabilistic population codes and topic models. Advances in neural information processing systems ( Bartlett P, Pereira F, Burges C, Bottou L, Weinberger K , eds), Curran Associates, Inc., pp 3068–3076. Bengio Y, Lee D, Bornschein J, Lin Z (2015) Towards biologically plausible deep learning. CoRR arXiv:1502.04156. Bishop CM (2006) Pattern recognition and machine learning. New York: Springer. Carreira-Perpinan MA, Hinton GE (2005) On contrastive divergence learning. In: Artificial intelligence and statistics ( Cowell RG, Ghahramani Z , eds), The Society for Artificial Intelligence and Statistics, New Jersey, pp 33–41. Dempster AP, Laird NM, Rubin DB (1977) Maximum likelihood from incomplete data via the EM algorithm. J R Stat Soc Series B Stat Methodol 39:1–38. Gerstner W, Kistler W, Naud R, Paninski L (2014) Neuronal dynamics: from single neurons to networks and models of cognition. Cambridge, UK: Cambridge UP. Haykin SS (2009) Neural networks and learning machines (Vol 3). Upper Saddle River: Pearson Education. Hinton GE, Dayan P, Frey BJ, Neal RM (1995) The “wake-sleep” algorithm for unsupervised neural networks. Science, 268:1158–1161. New York: Springer. Jank W (2006) The EM algorithm, its randomized implementation and global optimization: some challenges and opportunities for operations research. In: Perspectives in operations research, Vol 36 of Operations Research/Computer Science Interfaces Series ( Alt F, Fu M, Golden B , eds), pp 367–392. New York: Springer. Koller D, Friedman N (2009) Probabilistic graphical models: principles and techniques adaptive computation and machine learning. Cambridge, MA: MIT. Kushner HJ, Yin G (2003) Stochastic approximation and recursive algorithms and applications, Vol35. New York: Springer. Mensi S, Naud R, Gerstner W (2011) From stochastic nonlinear integrate-and-fire to generalized linear models. In: Advances in neural information processing systems. Curran Associates, Inc., Canada Vol 24, pp 1377–1385. Murphy KP (2012) Machine learning: a probabilistic perspective. Cambridge, MA: MIT. Rao RPN (2006) Neural models of bayesian belief propagation. In: Bayesian brain: probabilistic approaches to neural coding, pp. 235–264. Cambridge, MA: MIT. Rezende DJ, Wierstra D, Gerstner W (2011) Variational learning for recurrent spiking networks. Neural Inf Process Syst 24:136–144. Schacter D (2002) The seven sins of memory: how the mind forgets and remembers. New York: Houghton Mifflin Harcourt. The decision was a result of the Reviewing Editor Tatyana Sharpee and the peer reviewers coming together and discussing their recommendations until a consensus was reached. A fact-based synthesis statement explaining their decision and outlining what is needed to prepare a revision is listed below. The consensus was that the concerns raised could be addressed by revising the text to clearly state the assumptions, the novel contributions of this work compared to previous ones. In addition, both Reviewers objected to the use of the term “unsupervised” to describe the approach. The manuscript “Learning probabilistic inference through STDP” addresses the important and interesting problem of how networks of spiking neurons can perform probabilistic inference. Specifically, the work focuses on the the question how neural networks can learn, represent and access the probability distribution that governs the statistics of its inputs. Do these sentences refer to things that have been implemented in the simulations or are they descriptions of mathematical derivations? The authors word strong claims, such as “universal learning capabilities” and the “virtually unlimited access to learnt information” but again it is not clear to me if these refer to mathematical idealizations or biologically plausible circuit implementations. I find the two limited “toy-examples” stand in stark contrast to these grand claims. In addition, the shown data consists almost exclusively of side-by-side plots of two probability distributions. How can the reader tell if the clear discrepancies between them are good (as the authors suggest) or bad (given the simple tasks). I would find it extremely helpful if the authors would provide a quantitative evaluation of the reported performance, ideally including a comparison to an alternative state-of-the-art approach and, with view to their claims, an analysis of how their model scales up to larger target distributions. I also am confused by the authors choice to call their approach unsupervised (”without any supervisor or teacher”, “without any additional computational overhead or teaching signals”). If I understand the proposed implementation correctly, during learning both the input and the output of the learning circuit are specified by a given example (in addition to some other interventions that select the correct parts of the network to learn and block learning in the rest). Isn't fixing the output of a system a hallmark of supervised learning. In fact, in “What Can a Neuron Learn with Spike-Timing-Dependent Plasticity?” Legenstein et al. 2005 state: “We consider a supervised learning paradigm where during training, the output of the neuron is clamped to the target signal (teacher forcing).” I this sense I find the authors' choice to call the present learning scheme “unsupervised” misleading. I find it impossible to reconcile the example given in the significance statement about our ability to answer complex multifaceted questions like “whether Mr. X is likely to enjoy dinner with us” with the data shown in the results. I am puzzled to what extend the authors really think that they provide a model “which can explain this capability”. This paper attempts to construct a neurally plausible mechanism for representing and learning probabilistic generative models. They recapitulate past work showing how to represent probability distributions as a variant of a Boltzmann machine that uses spiking neurons. 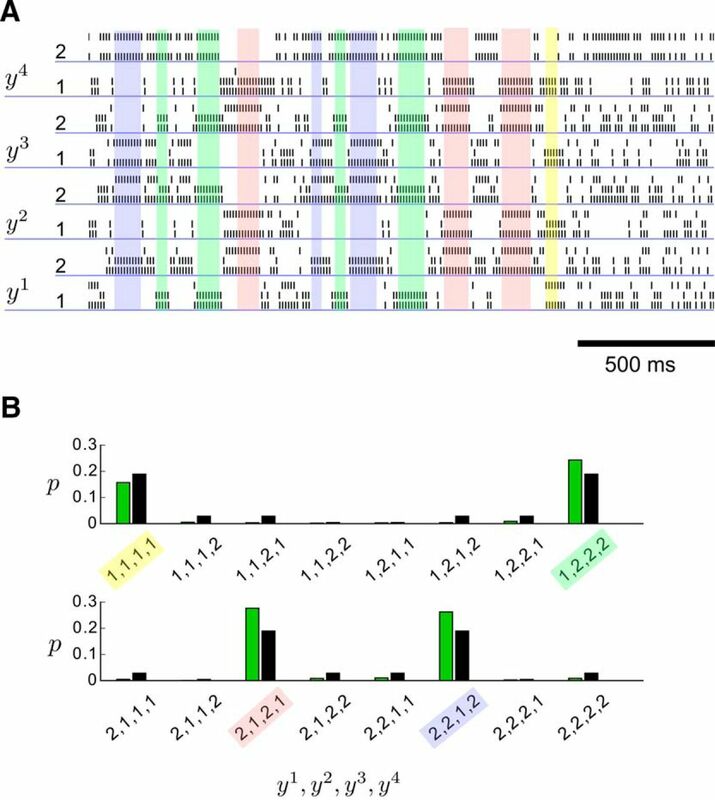 Then they recapitulate past work showing how the synaptic weights in this spiking network can be learned by Spike Timing Dependent Plasticity (STDP) that implements the EM algorithm. They prove some relevant theorems about the quality of their model, and illustrate the concepts with some simple inference examples. I think the only novel aspect here is to chain past STDP learning models together into a bigger network. Overall, I am quite sympathetic to their goals, and I think that this paper does makes an advance over past work. However, I recommend a some important clarifications, and I have a few caveats that I think are important to articulate to the target neuroscience audience. Although some of my concerns are quite serious, I do not expect all of them to be fully resolved, and so I do not necessarily view them as an insurmountable hurdle for publishing here. If the appropriate qualifications are present, readers can judge for themselves. Also, this is a difficult paper to read. Partly this is unavoidable, because of the complicated subject matter. But partly this is because there are some confusing aspects of their presentation that can be avoided. I make some suggestions at the end, but there are many places where the language should be improved. 1) First and foremost, what is actually the new advance here? Am I correct that it is just the chaining of multiple modules together? This needs to be stated crisply and clearly. 2) The most serious objection to biological plausibility, and my biggest problem with their model, is the very strong assumption that alpha^l populations are disjoint. How would that structure be learned? This means that no two alpha neurons can project to the same zeta target. This is a major architectural constraint; how would that be learned or enforced? I don't find this reasonable. Are there any sensible ways to relax this assumption? 3) WTA implies perfect anti-correlation between neurons dedicated to different states of the same variables. This is not observed experimentally. What are the consequences of relaxing this anticorrelation? 4) A second serious empirical criticism is that firing rate coding of probabilities (as opposed to log-probabilities) is inconsistent with contrast-invariant tuning. This is because higher contrast means higher confidence, and thus narrower population responses and narrower tuning. I am not aware of data that supports this narrowing of tuning with contrast, and on the contrary there is plenty of evidence showing tuning width remains constant with contrast. Related to this, how are we to interpret measured neural activity for neurons that are tuned to continuous variables in the world? If we have a neuron that is tuned to, e.g., orientation, then how do we identify the feature L that its responses favor? The peak? The mean? A range? In their model world, the features are clearly defined and these questions do not come up. But to relate this model to real neurons, these questions must be answered. 5) Pervasively, it is very unclear from the writing whether the learning and spiking cause the network to sample from the joint marginal or conditional distribution. Throughout, the main text seems to go back and forth on this question, and the methods are not much more helpful. I had a large number of confusions related directly or indirectly to this issue. 6) p28: “Minimizing the KL divergence between p*(z, x) and p(z, x; theta) also reduces the difference between the target conditional p*(z|x) and the model conditional p(z|x; theta).” I think this is false. Given some model constraints, one may reduce the cost function U(theta) more by reducing the KL divergence between p*(x) and p(x;theta) than by reducing J(theta), which is the average KL between p*(z|x) and p(z|x,theta). Whether this happens should depend on how the models are parameterized by theta. In other words, one may reduce an upper bound on J(theta) without reducing the value of J(theta). 7) The Knill & Kersten example is a Directed Acyclic Graph (DAG). However, the neural network implementing this DAG has cycles (Fig 4C). What is the significance of this difference? 8) Does their approach work for undirected graphs? How would a neural model of an undirected cyclic graph (e.g. Markov Random Field) differ? If so, are the connection weights symmetric on average? If not, why not? If so, then the lack of symmetric that they highlight could just be due to stochasticity, which would have little practical relevance and in fact should impede good performance. 9) p5: The network learns joint probabilities of >x,z<. The examples provided on pages 3-4 suppose that x and z are both observable variables. Then, for recursive model construction, it is the observed output variables that are chained together. In this way, all intermediate (z) variables are actually fully observed, and it is only the alpha neurons (‘a’ variables) that are hidden. Although an arbitrary distribution can be constructed as a mixture distribution, just like the universal function approximator this construction is not a particularly parsimonious or efficient representation of complex structure. Thus this architecture seems like a serious constraint, that chained learning only works when many intermediate variables are observable. Probably deeper or more structured latent representations can be learned as well, but it is not clear to me that STDP will suffice for that. 10) What happens to the learning during spontaneous activity? I expect that random deviations from the true distribution will cause the learning to drift from the weights learned from the p* distribution over pinned inputs. Is there some factor to prevent this, e.g. that modulates plasticity to occur only during presentation of inputs? 11) p39: The importance of the ‘null’ values is unclear. How much representational benefit is there to adding this null value? 12) The authors seem to make a distinction between the internal model (which is a joint distribution) and what the neurons encode (which is a conditional distribution). This should be spelled out, and this symantic distinction should be justified: it seems like an awkward distinction to draw, because both joint and conditional distributions can be reasonably thought of as an internal model. 13) p19: “In fact, our model provides perhaps the first modelling framework where one can interpret on the level of the underlying network of neurons how such generally important priors could be implemented in the brain, and possibly even genetically encoded (or predisposed).” This is a dubious claim both for priority and content, and should be removed. awkward: “the shape of an EPSP varies between shapes with a pronounced initial peak and smooth hills in dependence of the distance of the synapse to the soma (Williams and Stuart, 2002), and receives yet other shapes if amplified through NMDA- or Ca- spikes” - The shape receives other shapes? First full paragraph on p9 is awkward. Fig 4 caption: "learning, module" should not have a comma. "nominator", while apparently acceptable (news to me! ), is highly nonstandard. "Numerator" is preferred. p26: "the firing probability density of each neuron in alpha ideally remains constant" - I recommend adding "over time", since I first misinterpreted this sentence. Figure 6A appears to have an error, as the cylindrical example has only the side wall on the left and the cap on the right. it would have been helpful to specify earlier that the underlying model for one module is a mixture of multinomials. On p19 it is stated that: "some type of feedforward inhibition that prevents hidden neurons for learning a probabilistic relationship between random variables (x,z) for a specific value z=l to engage plasticity for examples (x, z), with z not equaling l." How is this "some type of feedforward inhibition" implemented in the model? I think this is an awkward restatement of the imposed architectural constraint mentioned above.